On Thursday morning, southwest Japan was struck by a strong and powerful 6.5 magnitude earthquake that has left many dozens injured and homeless. The earthquake was so strong that it threw people around and shut down both electricity and water supplies. In the Japanese city of Kumamoto, the Red Cross reports that nearly 50 people have been treated for injuries at the city’s hospital. There was no reported tsunami risk as the quake hit 7 miles beneath the earth on Japan’s island of Kyushu. The earthquake hit at 9:26 PM local time on Thursday evening. Many survivors said that the ground and the buildings has been shaking so severely that they couldn’t remain standing upright. The government has reported that at least 19 homes in the city have been destroyed and that many people still remain buried or trapped under the city’s rubble. Because of the lateness of the evening and the ensuing darkness, government authorities have yet to be able to get in and make an assessment of all of the damage thus far. Police, firefighters and Japan’s military defense forces have been deployed into the area to help with rescue operations and are expected to keep working throughout the entire night. Kumamoto is around 800 miles to the south of Tokyo. Some 16,000 homes are without power and another 38,000 have no supplies of gas. The nearby village of Mashiki has been reported to have suffered heavy damage as well. 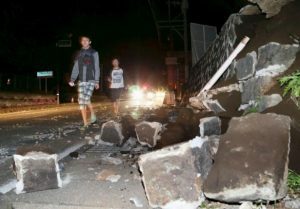 Several neighborhoods have been nearly completely destroyed with collapsing walls and debris. The only good news seems to be that none of Japan’s nuclear power plants were damaged by the quake. Most of the country power plants are offline and have been since the devastating 9.0 magnitude earthquake and tsunami hit the country back in 2011. Many of Japan’s passenger trains have stopped running just for safety reasons and should resume their schedules soon.